Note: Extractor Packages cannot ship by air express. Shipping charges that display in your shopping cart will be for "ground shipping" only regardless of what shipping method you choose. Here at Detail King we like to give auto detailers and car enthusiast all the tools necessary in a single place. 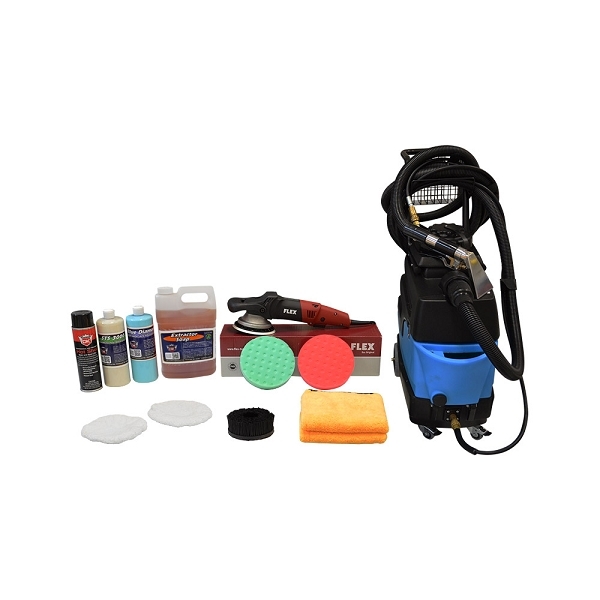 This Flex Polishing Machine package comes not only with the Flex XC3401VGR, but also with the Mytee Lite 8070, so that you may offer interior upholstery cleaning. This Flex & Mytee package is perfect for enabling you to do heavy to light polish & sealing the vehicle to a mirror finish. Also, be able to offer a full interior cleaning by using the Mytee 8070 Extractor! Break out the Flex DA Polisher and begin to polish with our Blue Diamond Polish to remove light imperfections & swirls, plus this product will add paint protection while restoring a wet look shine. Seal in your perfection with Detail King's STS 3000 Polymer Paint Sealant. Unlike other sealants, this products will last 12 months and keep your detail jobs looking superb.